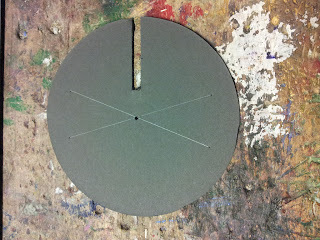 Cut a 5-6'' matt board circle using a compass and a utility knife or a circle cutter to make your shutter disk. 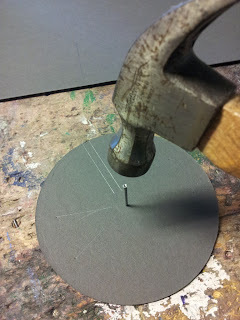 Make sure that you have a method of marking the center and the radial slot before cutting your circle out. Use a nail to poke a hole in the center of your shutter disk. The nail should be slightly smaller than your motor shaft. 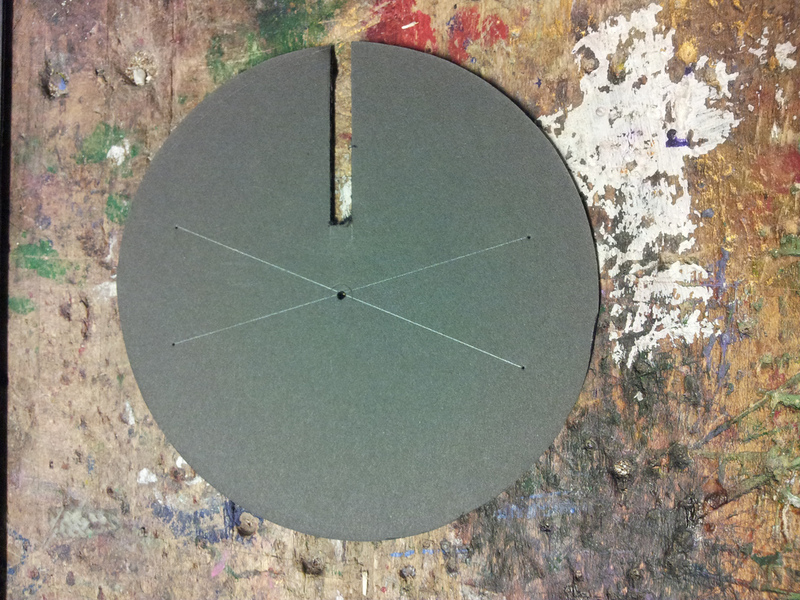 Cut a 1/8'' to 1/4'' slot about 1/3 of the way through the disk. One slot will allow good viewing of most things, but if you want to look at something that moves particularly fast you may want 2 or 3 slots. This will double or triple the scopes shutter frequency. 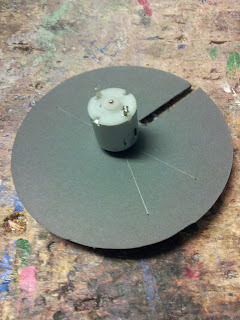 Stick the motor shaft into the center hole of the disk and apply a generous amount of hot glue to the far side making sure it stays relatively square. Alternatively, you can add a small matt board washer to the far side of the disk and glue on top of that for even more strength. Heres a simple clothespin-based momentary switch. 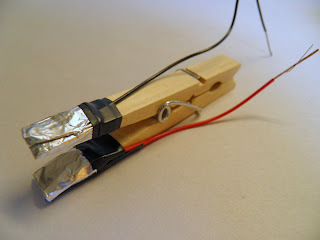 Strip your wires and wrap them around the handles ends of the clothespin, and then wrap the ends of the pin and wire with foil. Tape them in place with electrical tape. 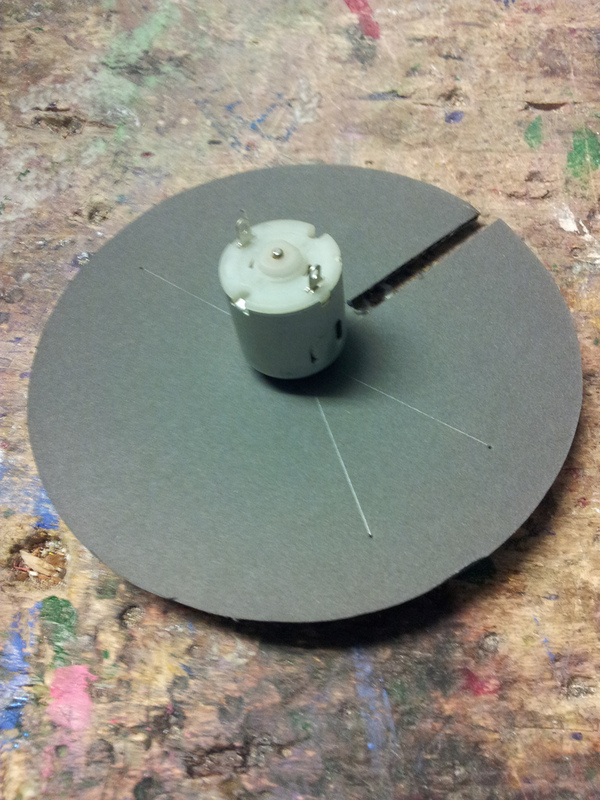 Here you can see the basic assembly. The motor and shutter disk have been hot glued to the top of the handle (10'' of 1x2''). The eye piece tube has been placed next to them. The momentary switch has been hot glued onto the side of the handle. A AA battery with a wide rubber band (we use inner tube) to hold the leads has been taped onto the upper portion of the handle. The basic circuit goes from the motor to the switch to battery and back to the motor. At first glance this design didn't appear to be very useful because it has no apparent speed control. Upon trying it we realized this wasn't and issue, because of the weight of the matt board the shutter disk speeds up and slows down slowly. By bringing the shutter up to speed and then letting it coast, you can reach a wide range of shutter speeds. Once you find a speed that works you can just pulse the switch briefly to maintain it. 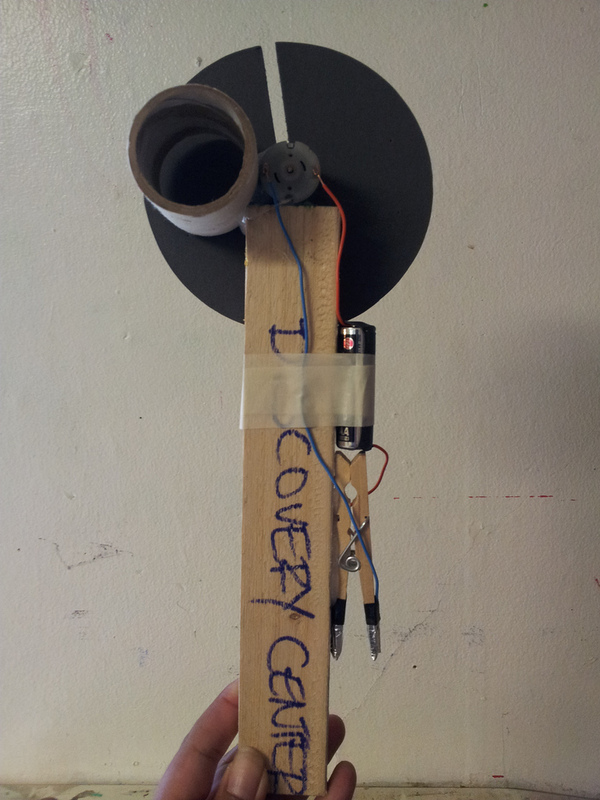 As with the manual stroboscope, looking at things with rotating or oscillating parts usually yields the best results. Things like scroll saws, fans, or car wheels can be made to look like they're not moving if you an match their rate of rotation or oscillation to the stroboscope shutter speed. Just as in the manual stroboscope, this device relies on persistence of vision to string together the moments when you can see through the slot. The result is that objects appear to move more slowly when viewed through the stroboscope. 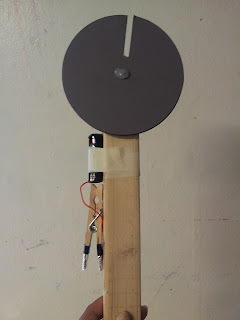 Using this setup with disks with two or three slots you can easily us it as a siren disk by blowing through the disk with a straw or a vinyl tube. Alternatively, you can use a siren disk with a ring of hole punched holes instead of a stroboscope slot disk to achieve higher frequencies.